SO MANY posts on the Instant Pot Facebook group belabor the subject of boiled eggs that I decided to do my own little experiment. I love boiled eggs, and never really had a “bad” one, so I wasn’t sure what all the fuss was about. But in the name of service, I decided to sacrifice a dozen eggs (I was going to cook them anyway!) and an hour or so of time to see if there really was a difference. Here’s how I controlled the experiment. 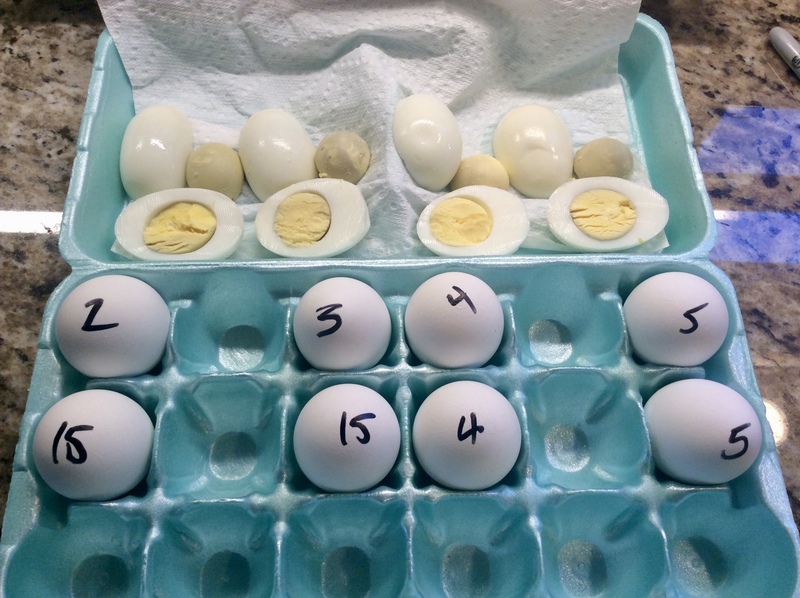 First, I examined each egg carefully to look for any that had lines or bumps that looked like it could have a hairline crack or weak spot, and found 12 that didn’t. Next, I let them sit for about an hour to come at least closer to room temperature. I placed them on a silicon trivet in the pot, larger side down, then cooked them, 3 at a time, for the times and releases you see in the picture. (Top egg pressure time, bottom egg release time.) One batch for 2 minutes, 15 minutes NPR, all the way to the “standard” 5-5-5. All were cooked in my 8 qt Viva, and each time I cooled the pot with running water before starting the next batch. Each batch went into an ice water bath after release. The results were all largely successful. I had NO cracked shells in any batch. All eggs had beautifully centered yolks. Each batch was fully cooked, with no runny yolks. None of the eggs had an excessive amount of grey around the yolk, but the 4-4-4 egg had essentially no grey at all. Was that the method, or the egg? My conclusion is that it’s really hard to ruin a boiled egg, and all methods produced acceptable results. Going forward, I plan to use the 4-4-4 method if I’m feeling attentive, and the 3-whatever-whatever method if I’m likely to get distracted!